VIP is widely considered as MBT fiercest rival in the region – VIP is listed on NASDAQ while MBT is listed on NYSE. Churn rate is defined as the total number of subscribers who cease to be a subscriber during the period (whether involuntarily due to non-payment or voluntarily), expressed as a percentage of the average number of our subscribers during that period. 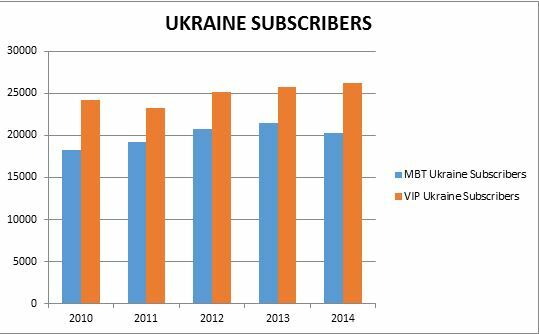 A vast majority of MBT subscribers are prepaid subscribers with no contractual commitment. This freedom allows customers to change operators easily – on top of the regulations for Mobile Number Portability. As of 2014, in Russia, 67% of the customer are prepaid and 33% are contract and corporate. In Ukraine, 91% are prepaid. MBT are constantly seeking to migrate the customer from advance plans to credit payment plans to stimulate ARPU and reduce churn. 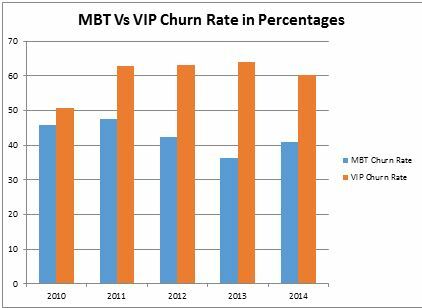 In comparison to VIP, MBT has obviously proven to have a more loyal base of customers as its churn rate is consistently lower than VIP in the past 5 years – hence, MBT would incur lower new customer acquisition costs as well because they have a more stable customer base. Also with lower the churn rate, there is less pressure on MBT to add new subscribers to generate more revenue. So they are less desperate and that means lesser chance for MBT to do harmful things like driving down their services price a lot in order to attract new customers. 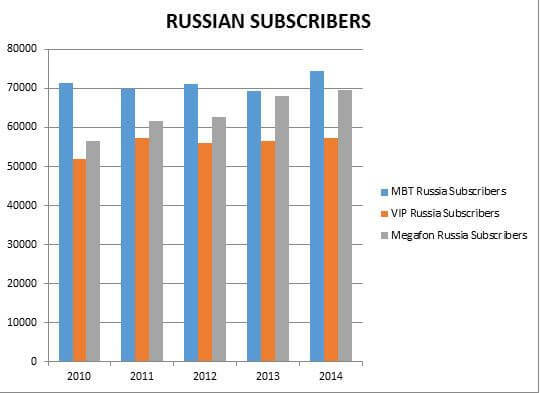 Overall, MBT still has the most number of subscribers and it is consistently higher than VIP and Megafon throughout the last 5 years. This will give MBT a more stable revenue source for years to come due to their higher number of subscribers. ARPU is a key indicator of the operational performance and pricing power for a telecommunications company as it measures the average monthly revenue generated from each customer. MBT does not score very well in terms of ARPU as compared to its other two competitors. Only in the recent 2014 year, it does pretty well – it edges out in terms of ARPU. 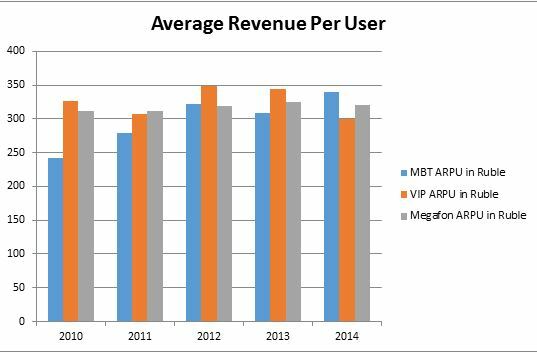 The ARPU has been increasing for MBT over the last five years while it is decreasing for VIP – the key drivers might be the increase in value added services such as video or apps downloads initiated by MBT. In comparing the bottom line, VIP result is horrible as compared to MBT: as of now, VIP is losing $1.6 billion while MBT earned $766 million for the past twelve months. This added to the confirmation that by having a higher number of existing subscribers and increasing ARPU over the past few years works. That gives MBT the added advantage to maintain a positive net income despite the currency devaluation and political tensions surrounding Ukraine and Russia. According to a PwC survey, Telecommunications Company usually has a problem controlling their capital expenditure (CAPEX). When they asked more than 30 leading operators why capital management is such an ineffective process, industry leaders top reason was that their CapEx planning is driven by technology and not business objectives. In essence, capex is an important function of a company cash flow in many industries as it serves as an investment in physical assets for future cash flow. Every year company would spend money to repair, replace or expand the physical assets in terms of CapEx. Capex uses operating cash flow and the remaining money is known as free cash flow. Capex is important to ensure that a company remains efficient in its operations and maintain or increase margins for the future. Capex is important to ensure that a company remains efficient in its operations and maintain or increase margins for the future. 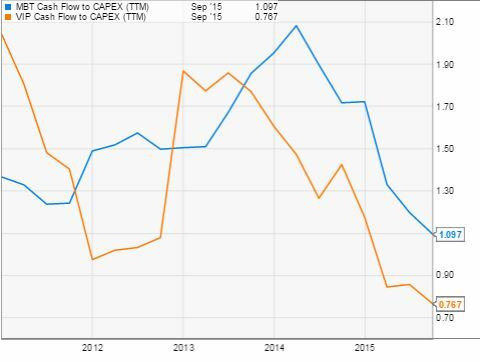 Currently, VIP capital expenditures are more than its capex at a cash flow to capex ratio of 0.767. In comparison, MBT ratio is at 1.097. 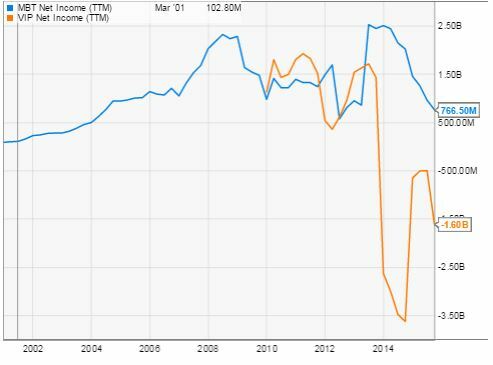 Despite the political situations involving Ukraine and Russia, in terms of cash flow to capex, MBT is able to hold up admiringly much better as compared to its fiercest rival, VIP. I like to use operating margin as a gage on comparing company with its competitors because it really measures how efficient a company strategy is in terms of daily operations as it measures the proportion of a company’s profit after paying for variable operating expenses. 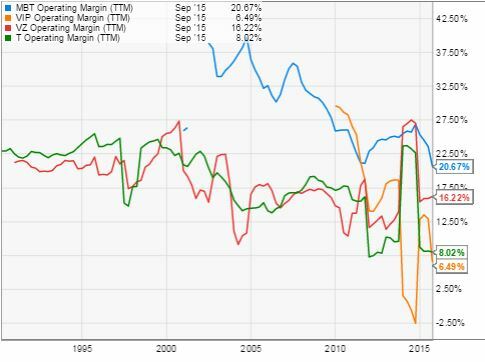 MBT operating margin is intriguing on a number of levels – it is at 20.67% which is higher than Verizon, AT&T and VimpelCom at 16.22%, 8.02%, and 6.49% respectively – in fact, it was consistently higher than them for the past 10 years. The fact that MBT can have an operating margin that is consistently higher than Telco that is consistently ranked top five in the world is no easy feat – it has to come from the company strategy of not engaging in price wars with its competitors in Russia- instead focusing on providing quality service. Competitive advantage over other telecommunications company focuses generally on price, product functionality, the range of service offerings and customer service. It is not easy to edge out over other telecommunications company as the industry is generally very price competitive- a combination of the right business plan specific to the current environment and a good management is needed. MBT was recognized as the ninth leading telecommunications brand in the world in 2014 by BrandZ™ 2014 ranking. It was also the only Russian telecommunications company to be placed there. This is the seventh consecutive year that it was placed on the top 100 global most valuable brands. Maneuvering through tough times is crucial for companies- if they want to enjoy the sunshine after the rain. In this case, enjoying the Russian economy recovery after the current recession. Vimpelcom entered into an agreement with MBT for joint planning, development and operation of 4G/LTE networks in 36 regions of Russia. MBT will build and operate 19 of them while Vimpelcome will build and operate 17 of them. Within the first 7 years, they plan to share base stations, platforms, infrastructure, and resources with each of them maintaining its core network. 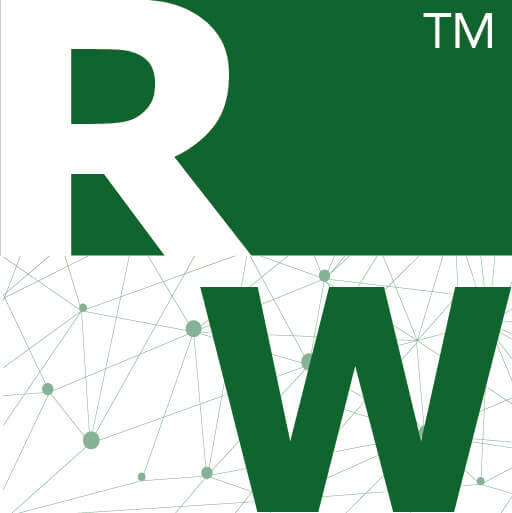 This is done in order to reduce the costs of deploying networks in areas previously deemed as unattractive from a commercial standpoint. 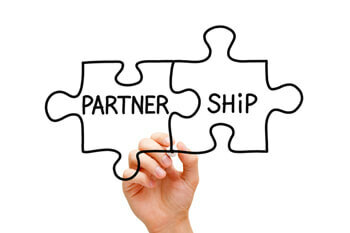 MBT and VOD announced in October 2015 that they have agreed to roll out 3G and develop a number of new services in the Ukraine using the Vodafone brand in Ukraine as opposed to MTS Ukraine – due to the tensions between Russia and Ukraine I think this is a good strategy – despite MBT leaving behind their valued brand. In terms of mobile apps downloads for Android and IOS, Russia is ranked among the top 5 countries in the world in terms of the total number of download. One interesting thing to note in Russia is that 87% of the people cannot read English and 70% of them only speak Russian. This means that the applications people use have to be in The Russian language – MBT has done well by inventing an alternative application store (on top of the existing Ios and Android Store) for the Russian market which has over 7000 applications and it is well positioned for the usage of its 106 over million subscribers. The application store is another source of revenue for MBT which I believe will be well positioned to contribute more to their ARPU is the future. 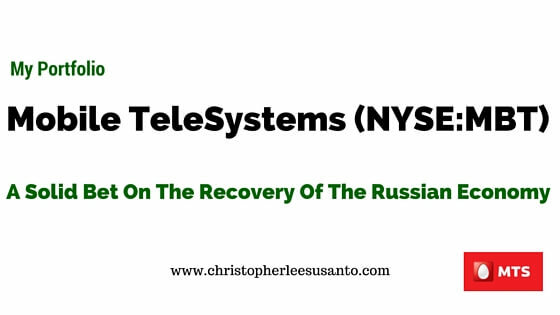 This article is to be continued in part 3 of 3 whereby I will be talking about my 6 Telecommunications Company Stress Test Checklist and my conclusion to my long position on MBT.